Enlarge / A screenshot of one of the uTorrent PoC exploits in action. Two versions of uTorrent, one of the Internet’s most widely used BitTorrent apps, are vulnerable to a host of easy-to-exploit vulnerabilities that allow attackers to execute code, access downloaded files, and snoop on download histories, a Google Project Zero researcher said. uTorrent developers are in the process of rolling out fixes for both the uTorrent desktop app for Windows and the newer uTorrent Web product. The vulnerabilities, according to Project Zero, make it possible for any website a user visits to control key functions in both the uTorrent desktop app for Windows and in uTorrent Web, an alternative to desktop BitTorrent apps that uses a web interface and is controlled by a browser. The biggest threat is posed by malicious sites that could exploit the flaw to download malicious code into the Windows startup folder, where it will be automatically run the next time the computer boots up. Any site a user visits can also access downloaded files and browse download histories. In an e-mail sent late Tuesday afternoon, Dave Rees, VP of Engineering at BitTorrent, the developer of the uTorrent apps, said the flaw has been fixed in a beta release of the uTorrent Windows desktop app, but has not yet been delivered to users who already have the production version of the app installed. The fixed version, uTorrent/BitTorrent 3.5.3.44352, is available here for download and will be automatically pushed out to users in the coming days. In a separate e-mail sent Tuesday evening, Rees said uTorrent Web had also been patched. “We highly encourage all uTorrent Web customers to update to the latest available build 0.12.0.502 available on our website and also via the in-application update notification,” he wrote. Earlier Tuesday, Project Zero researcher Tavis Ormandy warned the flaws remained unfixed in uTorrent Web. Rees’s later e-mail indicated that’s no longer the case. 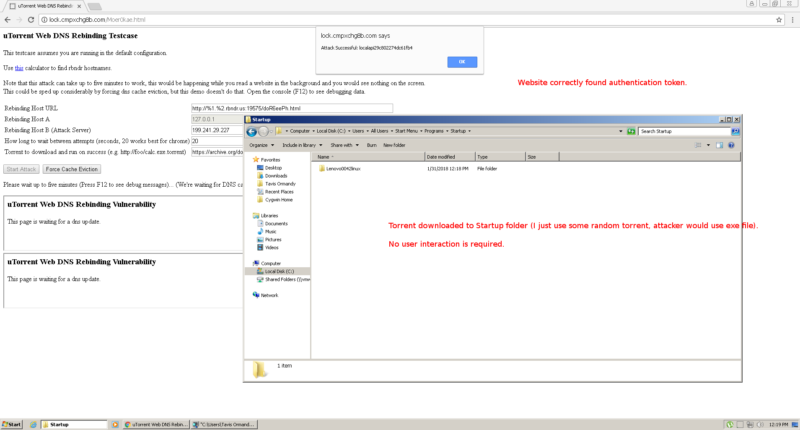 Ormandy’s proof-of-concept exploits include this one for uTorrent Web and this one and this one for uTorrent desktop. They use a technique known as domain name system rebinding to make an untrusted Internet domain resolve to the local IP address of the computer running a vulnerable uTorrent app. Ormandy’s exploit then funnels malicious commands through the domain to get them to execute on the computer. Last month, the researcher demonstrated similar critical vulnerabilities in the Transmission BitTorrent app. Neither Ormandy nor Rees included any mitigation advice for vulnerable uTorrent versions. People who have either the uTorrent desktop app for Windows or uTorrent Web installed should promptly stop using them until updating to a version that fixes these critical vulnerabilities. You are reading an article on the uTorrent bugs let websites control your computer and steal your downloads. All materials on the site Gadgets F, а также и статья uTorrent bugs let websites control your computer and steal your downloads - written for the purpose of information enrichment and we are happy if you like our magazine.